Upon arrival, the thighs are selected strictly, selected by weight, submitted to the health examination and, in the presence of the Consorzio inspector, equipped with a metal seal that will guarantee origin and certain date of salting. 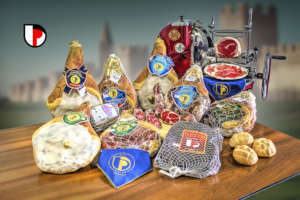 This phase is the first and most important for the purpose of the acquisition by the ham of that sweetness that is one of its peculiar characteristics. 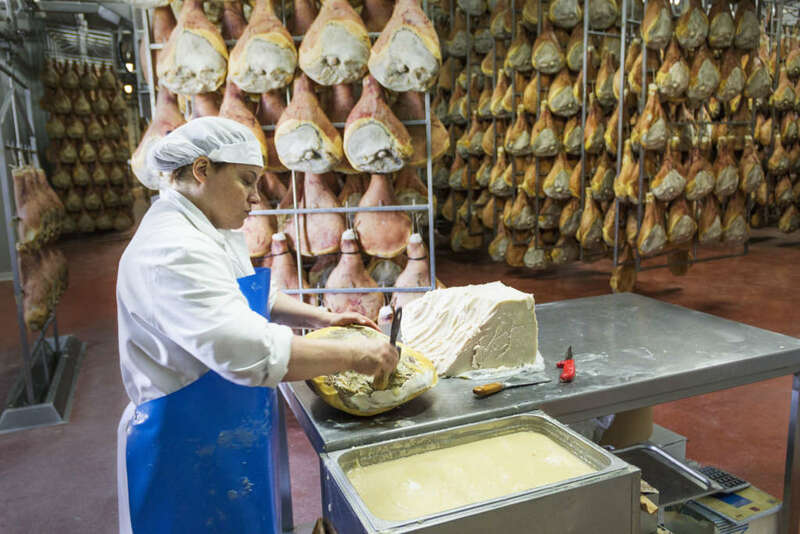 It is here that the skill of those who “caress” the thighs becomes the art of making Prosciutto Veneto. 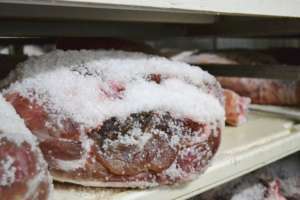 The skill of the saler does not consist in distributing the amount of salt on the ham, but rather in removing it from salt at the right time (between the 10th and the 15th day), in relation to the weight of the thighs. 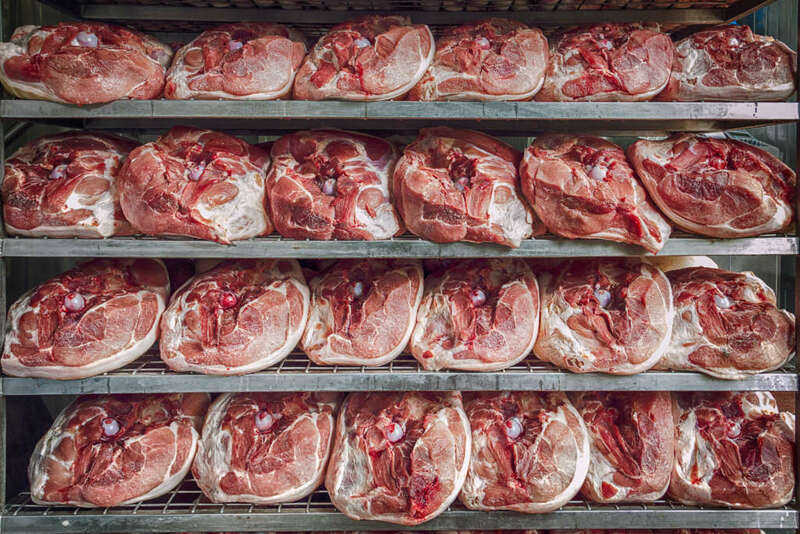 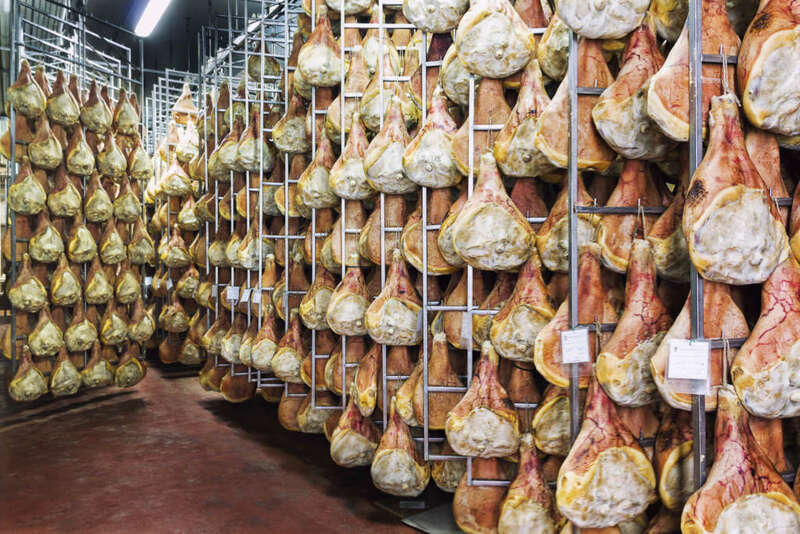 At this point the ham is lightly pressed and placed at rest at controlled temperature and humidity for 60 days, time in which the drying process begins and the salt penetrates uniformly throughout the muscle mass. 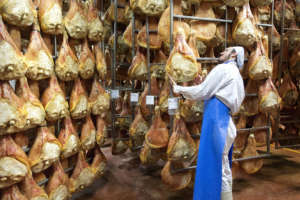 The ham is worked, finished, and left to dry naturally. 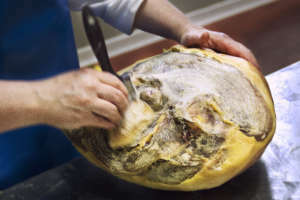 Now begins the long phase of natural maturation. 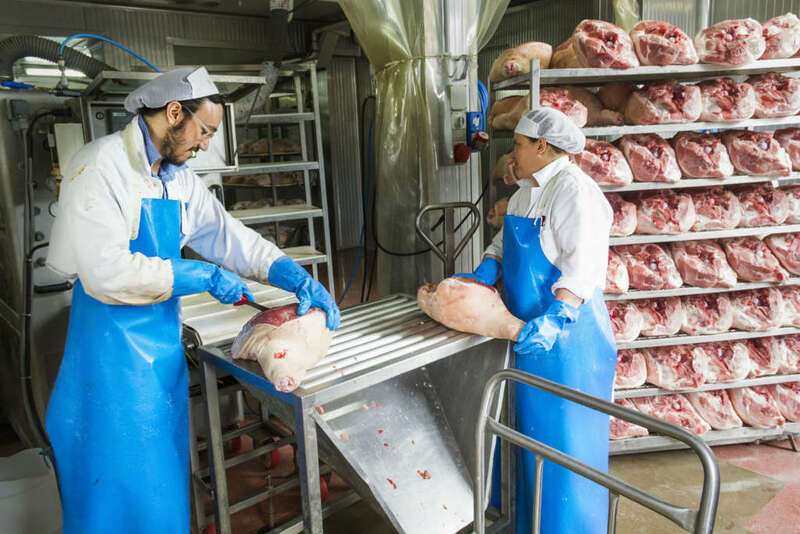 A first quality control is carried out by pointing with a needle probe which allows to evaluate the progress of maturation. 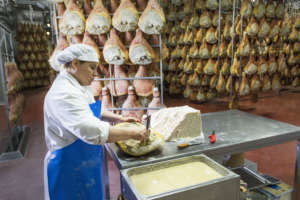 The application of the “stucco”, a simple natural mixture of cereal flour and pork fat, protects the ham and maintains its softness intact throughout the subsequent aging period. 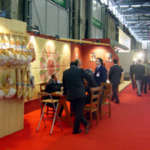 Once the minimum seasoning required by the Law has been reached, the Consorzio inspector carries out a further quality control. The ham considered suitable is branded in focus with the Lion of St. Mark and the word VENETO, symbols that guarantee the characteristics protected by the Law. 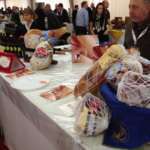 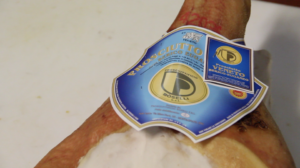 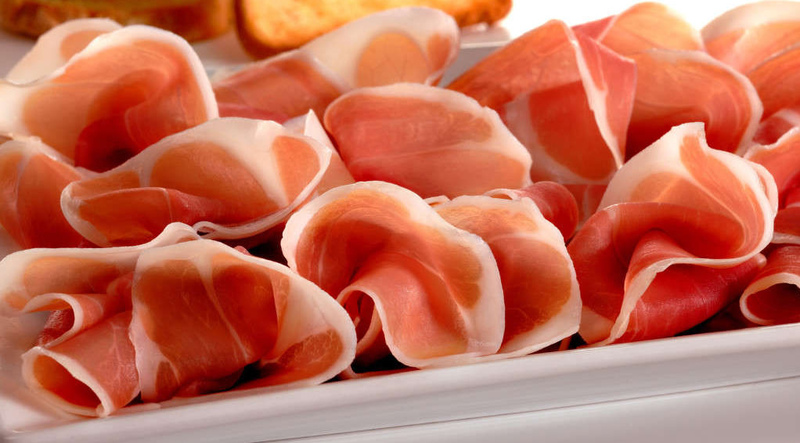 Equipped with the brand of the producer, the Prosciutto Veneto is distributed for marketing. The prolonged seasoning enhances and enhances the aromas, flavor and fragrance, fruits of the long and patient work of the Venetian Prosciutti Masters. 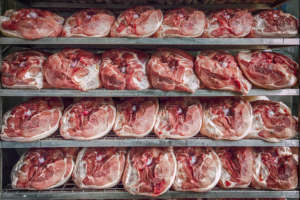 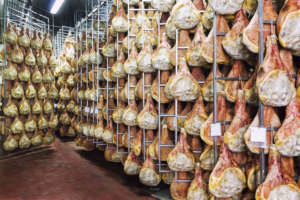 produce 120.000 prodotti l’anno tra prosciutti nazionali DOP, culata e speck.